Based in Slinfold, West Sussex, Mecmesin was established in 1977 and has grown to become a global leader within the field of designing and manufacturing force and torque test equipment. Reflecting the worldwide popularity of this still privately owned company’s range of products, Mecmesin now boasts regional offices in the US, China, Thailand and France. In addition, the company has a global network of distributors in more than 50 countries able to provide technical expertise and after-sales support to Mecmesin’s overseas customers. From simple hand-held instruments to fully-comprehensive, computer controlled test systems; Mecmesin designs products to suit a multitude of diverse applications and budgets. The company’s products include force gauges, torque gauges, tensile and compression testing systems, torque testing systems, in addition to associated software. Mecmesin offer 3 distinct levels of test systems, including simple to use motorised systems, touch screen controlled systems - ideal for the use on the shop floor - and fully-featured computer controlled systems. The company’s range of test solutions allow measurements according to BS, DIN, ASTM and ISO standards, from 2.5N for gauges, to twin-column systems testing of up to 50kN. The focus of this ISO 9001 accredited company has always been to provide high quality test solutions, which are an affordable alternative to the many higher-priced systems that are available. Mecmesin’s philosophy enables small and large businesses alike to undertake a range of quality control checks on its products without compromising on precision and accuracy. The robust design of the company’s systems ensures that they are able to withstand harsh shop floor conditions and perform tests at the point of production, negating the need for expensive laboratories to certify consistent quality. The wide range of checks that can be performed by Mecmesin instruments helps to ensure the highest standard of customer’s product quality, conformance to standards, the optimisation of product design, cost savings, maximisation of performance, efficient production and minimum wastage. Based in Burgess Hill, West Sussex, Baty International is one of the world's leading manufacturers of Co-ordinate Measuring Systems, Gauging Products and not least Optical Profile Projectors. The Baty R400 Profile Projector purchased by Mecmesin combines high-accuracy, non-contact measurement and inspection with a large 300mm x 150mm measuring range. The bench mounted profile projector boasts a long list of standard features, such as a 400mm screen with 90° cross-lines, chart clips and digital angle measurement with a resolution of 1 minute of arc. Optimum profile illumination is delivered by an efficient halogen lamp with a green filter, whilst surface illumination is achieved via high intensity fibre optics. The R400’s sturdy work-stage features two machined T-slots to allow even the most awkward or fragile workpieces to be held securely throughout a measuring routine. 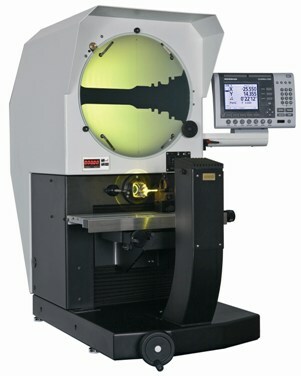 To facilitate accurate thread form projection, the R400 also allows for a helix adjustment of the light source. Lens magnification options of x10, x20, x25, x50 and x100 are available, whilst further options include a comprehensive collection of work holding fixtures, an internally fitted automatic edge sensor, a swing over lamp-house to allow improved access to the work-stage and a cabinet stand providing a solid base with storage. For customers needing fast throughput automated measuring, a CNC option is available, whilst Baty is also able to supply the R400 fitted with a wide range of electronic measuring systems and readouts to suit customers’ individual requirements. For more information on Baty's R400 Profile Projectors click here.